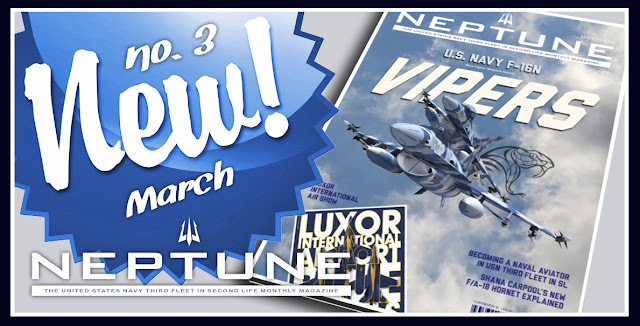 NEPTUNE No.3 out at last! My apologies for the untimely fashion NEPTUNE no.3 came out. March was a particularly hard month in real life but here we are and catching up. Thank you for your support. Go Navy! 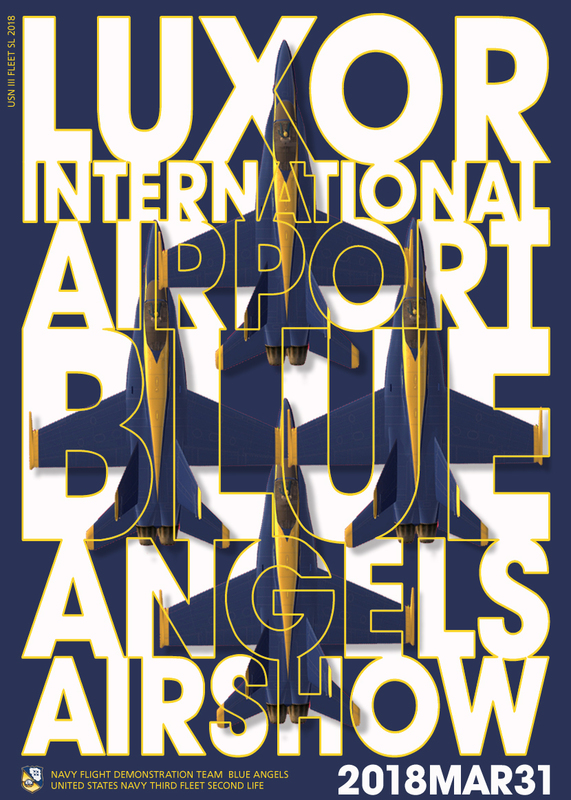 Welcome to the Luxor International Airport Air Show, March 31, 2018. The Navy does have operational General Dynamics F-16's, only they are named "Vipers" to set them apart from the U.S.A.F. "Fighting Falcons". Used in real life first at N.A.S. Miramar and the Navy Fighter Weapons School and to this day at N.A.S. Fallon with the Naval Strike Air Warfare Center (Topgun's heir), the "Vipers" serve in dissimilar air combat tactics (D.A.C.T.) training in the adversary role, providing the fleet with a light and highly maneuverable aircraft to fly against the front line naval fighters during TOPGUN engagements. "Bad Girl 24" at N.A.F. Eagles Nest. Vipers on the tarmac at Miramar before an intercept exercise - class 1 of 2017. As in real life, N.A.S. Miramar has a number of F-16N Vipers used for D.A.C.T., increasing the capacity and options of the local aggressors. At this time we have 4 naval aviators assigned to the aggressor squadron (VFC-13 Saint Adversaries), who also fly the F-5E Tiger, the A-4 Skyhawk, and occasionally soviet fighters "acquired" for D.A.C.T. engagements in Vietnam with 7th Fleet. The VFC-13 squadron leader, CAPT. Vickster "Speed" Kühn, also flies an F/A-18B Hornet assigned to the N.F.W.S. (Black Zero Zero). VFC-13 aggressors at Eagles Nest: F-15N Viper and F-5E Tiger. Bad Girls 24 and 26 over the Aldabra Sea, North of N.A.S. Miramar. Aggressor pilots come from front line squadrons at Miramar and also from TOPGUN crews that made top of their class, whom are given the option of becoming aggressors with VFC-13 as well as N.F.W.S. instructors. You can see the Viper's profile here!